A report by the Resolution Foundation this week highlights the mismatch between official employment and pay data. When it talks about employment and job creation, the government includes the self-employed. When it comes to pay, though, the incomes of the self-employed are left out. This isn’t because the government is cooking the books. It’s been done this way for years. But because of the way the labour market has moved, this peculiarity shows the Coalition’s figures in the best possible light. Total employment is up, mostly because of self-employment. Take out self employment and the figures would be rubbish. The government wouldn’t have had much to boast about until the back end of last year. 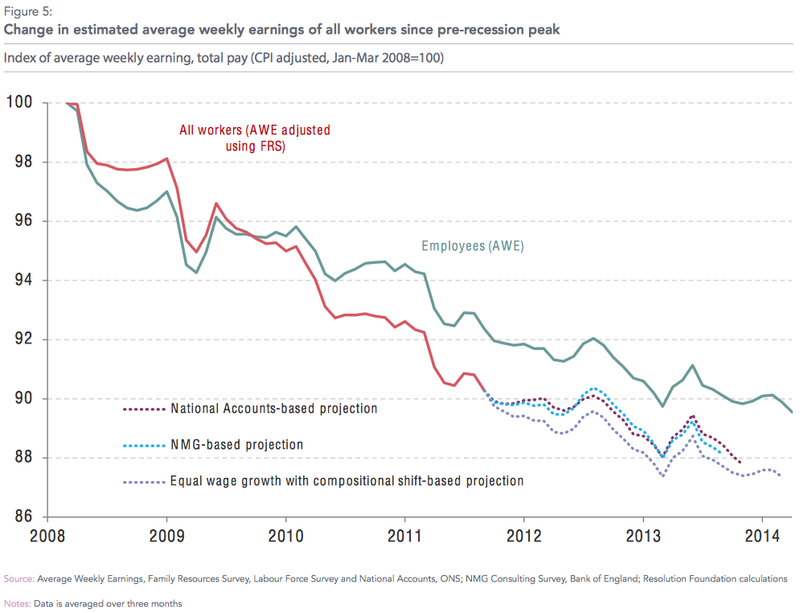 Leave the self-employed out of the pay calculations, though, and the full extent of the drop in earnings is disguised. The source of official earnings data, the Annual Survey of Hours and Earnings (ASHE), does not include the self-employed. The Resolution Foundation has used data from the Family Resources Survey (FRS) to calculate the gap between employee and self-employed earnings. The median pay of the self-employed has been way below that of employees for some time. The mean, though, has often been higher, inflated by a few people with very high earnings at the top. The distribution of self-employment earnings is much wider than that for employees. Since 2008, though, even the mean has fallen. This finding is consistent with the HMRC data which showed a drop of £8 billion in self-employment earnings between 2008 and 2012. That’s £8 billion less cash between 600,000 more self-employed people. Before allowing for inflation! This collapse in earnings was so severe that even the wealthy few at the top could not keep the mean pay figure for the self-employed from falling through the floor. 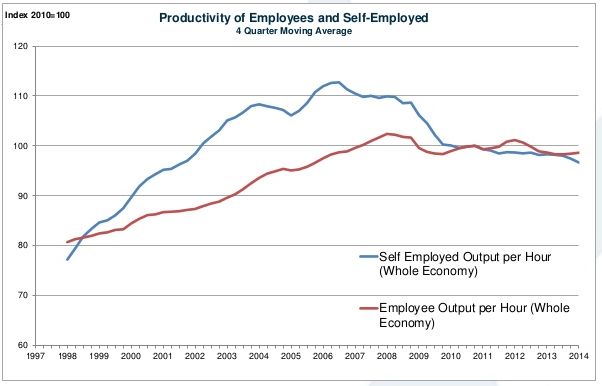 Whatever measure you use, the pay of the self-employed is now well below that of employees. Had the self-employed been included in the official figures, at first, the decline in pay after the recession would not have looked quite as bad, thanks to those high earners at the top. Over time, though, as the number of self-employed people rose and their pay crashed, the fall in earnings would have looked much worse. This chart, then, gives us a much more accurate picture of the decline in pay since 2008. It is likely, then, that the fall in earnings up between 2008 and 2012 (which is as far as the FRS data goes) was around 10 percent, rather than the 8 percent in the official figures. The Resolution Foundation’s projections suggest that it may have fallen by over 12 percent by now. If the self-employed are going to form a larger proportion of the workforce from now on, and it looks very likely that they will, it makes sense to include them in official earnings figures, along with those for employment. Not to do so is, as Gavin Kelly says, to ignore the canary in the mine. 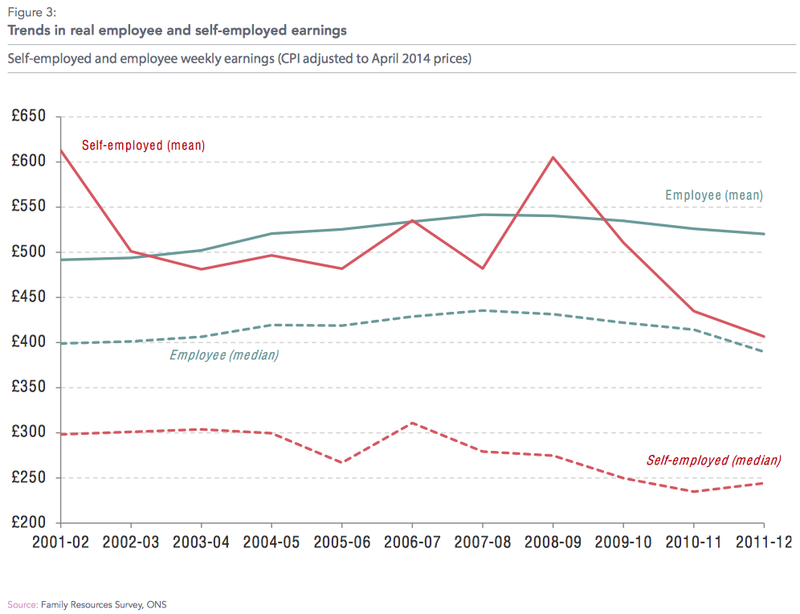 The collapse in self-employment pay has, until recently, been one of the untold stories of the recession. Gavin’s Guardian piece argues that the omission accounts for a 20-30% underestimation of the fall in earnings. Such a staggering number lends support to the view that the productivity fall is partly about labour market behaviour. For any fixed national income, our labour market is relentlessly good at getting people into work, in whatever form they can. Hence the numerator stagnates, the denominator expands, the ratio (productivity) falls. The damning residual. 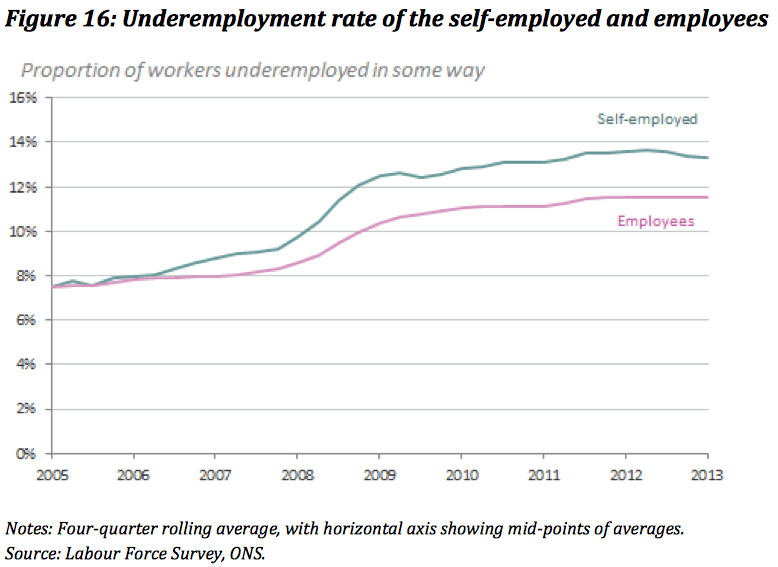 This chart, from the ONS Trends in Self-Employment study published yesterday, illustrates his point. 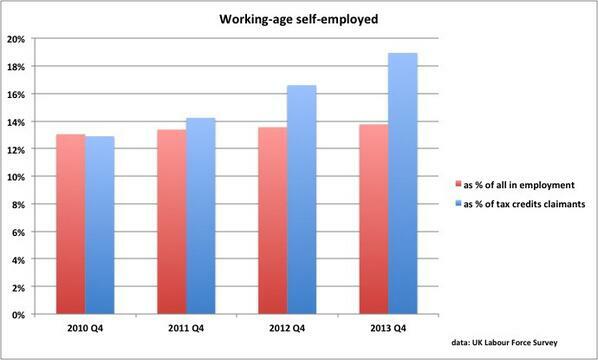 More self-employed people, not much extra work, so falling productivity, under-employment and collapsing pay. And, of course, reliance on state benefits. So, while the employment figures were looking fine, just about everything else wasn’t. Earnings, productivity, tax receipts and the benefits bill all went in the wrong direction. This was most acute among the self-employed. ‘Canaries in the mine’, is one way of putting it. Looking at all this, though, ‘punch bags of the recession’ sounds more apt.